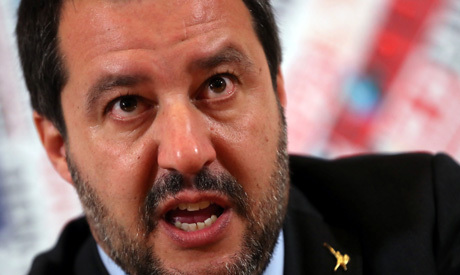 Deputy Prime Minister Matteo Salvini, continuing a war of words between Rome and Paris, said on Tuesday that France was not looking to bring calm to violence-ravaged Libya because its energy interests there rivalled those of Italy. France's Foreign Ministry and the French president's office declined to respond immediately. On Monday France summoned Italy's ambassador after Salvini's fellow deputy prime minister, Luigi Di Maio, accused Paris of creating poverty in Africa and generating mass migration to Europe. "In Libya, France has no interest in stabilising the situation, probably because it has oil interests that are opposed to those of Italy," Salvini told Canale 5 TV station. Italy's Eni and France's Total have separate joint ventures in Libya, but Eni's CEO Claudio Descalzi denied in a newspaper interview last year that there was any conflict between the two firms in the north African state. Asked about the latest diplomatic spat with Paris, Salvini said on Tuesday: "France has no reason to get upset because it pushed away tens of thousands of migrants (at the French border), abandoning them there as though they were beasts. We won't take any lessons on humanity from Macron."